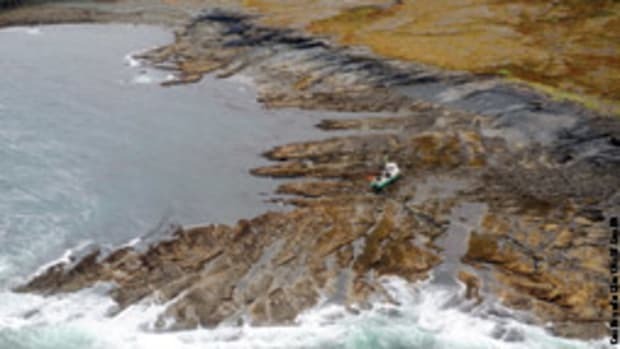 A 70-year-old Canadian man was stranded in September for two days in British Columbia’s remote Central Coast region after he had mechanical problems and was washed ashore by tide and wind. 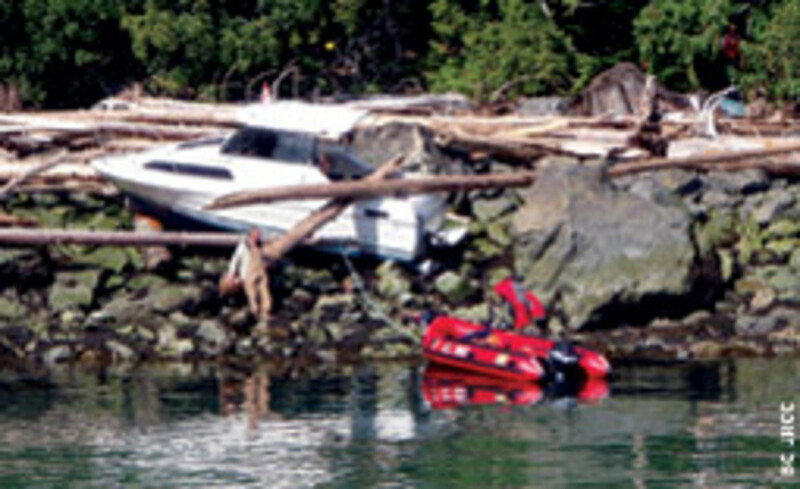 Rescuers say he was headed to the island community Bella Bella but transited the wrong inlet. Three men were rescued Aug. 3 after their 20-foot boat took on water and sank south of Martha’s Vineyard. Coast Guard Sector Southeastern New England received a mayday call at 2:24 p.m. from the operator of the Cynthia Z that the boat was awash with three men aboard. The men put on life jackets and went into the water with a handheld radio. 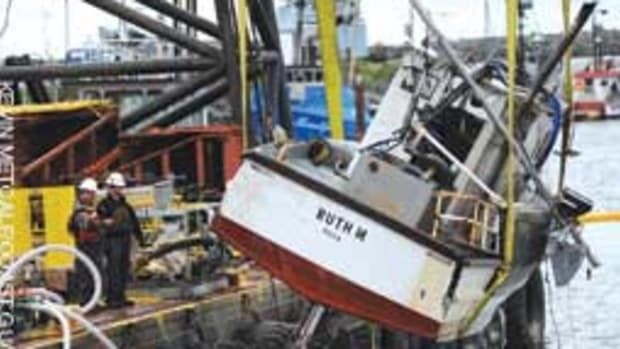 The operator told the Coast Guard that he was somewhere south of Martha’s Vineyard near the 20-fathom curve. The Coast Guard launched a 47-foot Motor Lifeboat from Station Menemsha and an MH-60T Jayhawk helicopter from Air Station Cape Cod. Watchstanders also issued an urgent marine broadcast over VHF channel 16 to notify all boaters in the area that three people were in the water and needed assistance. The fishing vessel Patients heard the broadcast, found the boaters 15 minutes later and rescued them. The MLB crew brought the three men back to Station Menemsha, where they were debriefed and released. Coast Guard and local rescue agencies saved a 56-year-old man who fell overboard Sept. 9 in Manhasset Bay after he was hit in the head by the boat’s boom. 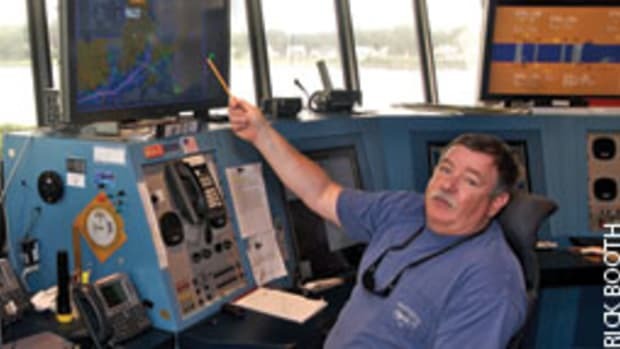 Sector New York received a distress call from the other person on board at 8:22 p.m. on VHF channel 16, and crews from several nearby towns launched. The man was out of the water within minutes of the initial call; he was not wearing a life jacket. A Coast Guard administered CPR during the ride to Manhasset Town, N.Y.
A rescue crew from Coast Guard Station Annapolis, Md., helped three people north of the Chesapeake Bay Bridge on Aug. 20 after their 23-foot boat began taking on water. The boaters contacted Sector Baltimore watchstanders at 12:50 p.m., saying they were able to keep up with the flooding. 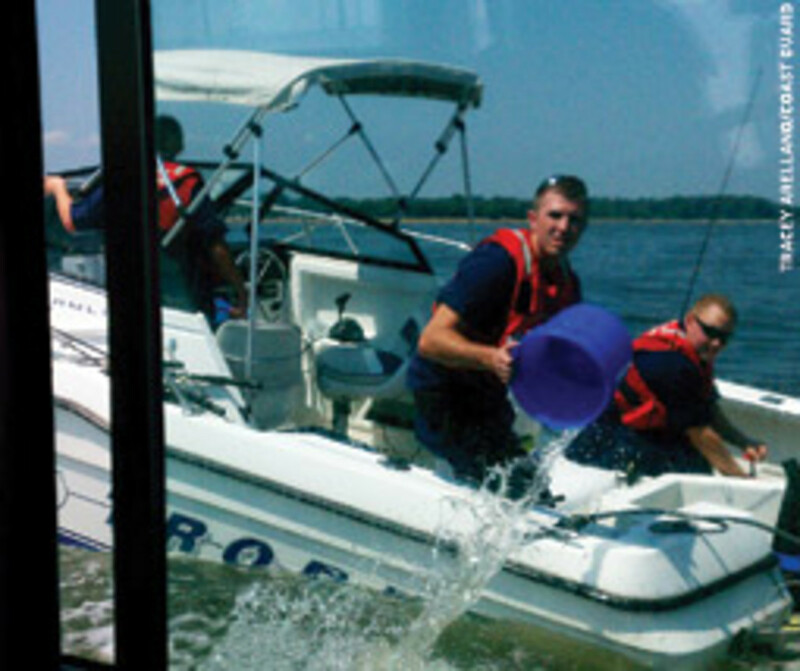 Two 25-foot Response Boat-Small crews from Station Annapolis, the Natural Resources Police and the Anne Arundel Fire Department launched to assist. The Coast Guard crews arrived on the scene, transferred three members and a dewatering pump to the sinking boat, and began towing it to Sandy Point State Park in Annapolis. No injuries were reported. 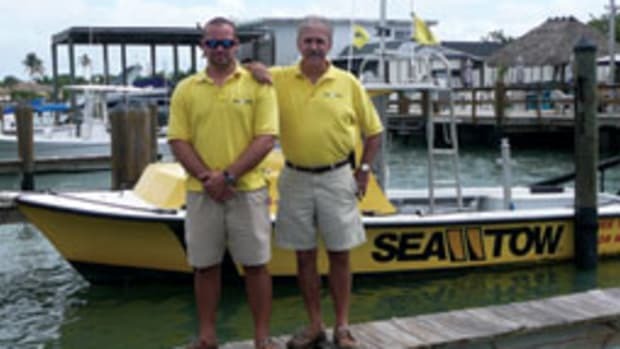 The Coast Guard rescued four people July 22 after they were ejected from their 23-foot skiff near the Anclote River and Anclote Key, Fla. Watchstanders at Sector St. Petersburg received a report via 911 at 9:10 p.m. that two men and two women were ejected from their boat, possibly because of a steering malfunction. They swam to the nearest river marker, where they called 911 on a cell phone. A 25-foot Response Boat-Small from Station Sand Key arrived at 9:21 p.m. and took the boaters to the Anclote River Park ramp. 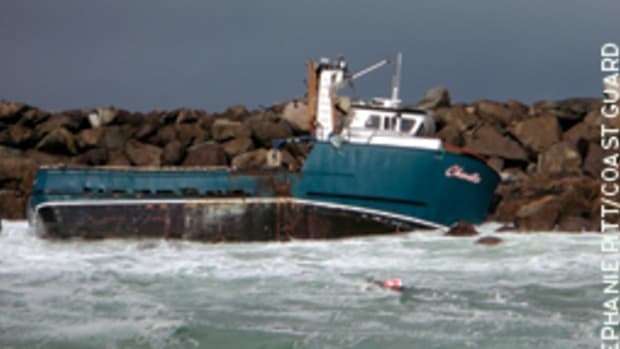 The owner had TowBoatUS tow the boat to shore. 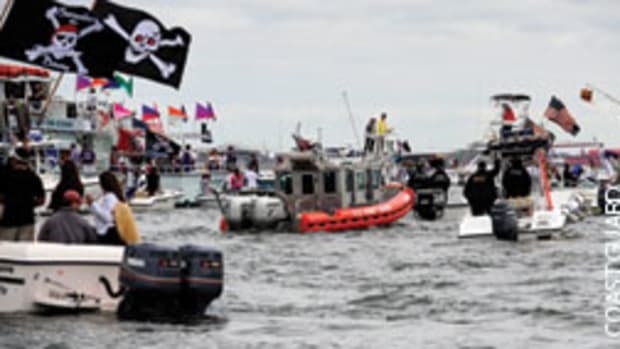 The Coast Guard cited a boat owner on a charge of boating under the influence of alcohol July 30 in Great South Bay, N.Y. Three people in a 22-foot boat, adrift and out of gas, waved down a boat crew from Station Fire Island at about 8 p.m. The Coast Guard boarding officer, after pulling alongside, saw that the people aboard appeared to be intoxicated. The boarding team conducted field sobriety tests and gave a chemical breath analyzer test to the operator and his passengers, all of whom failed. The boarding team did a vessel safety check and cited the owner on charges of failing to equip his boat with navigation lights and having unserviceable life jackets. A Suffolk County police marine unit towed the boat to a marina. 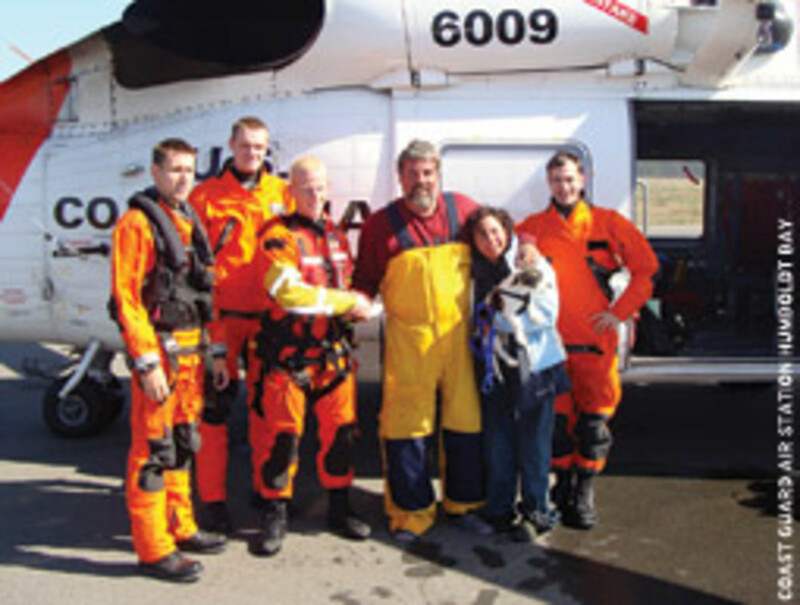 Liveaboard cruisers Chuck Fleer (yellow coveralls) and Taz Kai, both of Tacoma, Wash., along with their dog, Sadie, were rescued Sept. 2 by an MH-60 Jayhawk helicopter crew from Air Station Astoria, Ore. They were en route to Hawaii when their 58-foot sailboat, Gypsy Soul, began taking on water in heavy seas and an electrical fire broke out in the engine room 130 miles off northern California. The Coast Guard and several local fire departments helped two boaters Sept. 4 after receiving a report that a fire had broken out aboard their 65-foot yacht in the Pungo River near Belhaven, N.C. Watchstanders at the Sector North Carolina Command Center received a call via Rescue 21 about 2 p.m. from a crewmember aboard the motor- yacht Echelon reporting a fire in the engine room. An MH-60 Jayhawk helicopter crew from Air Station Elizabeth City and a 25-foot Response Boat-Small crew from Station Hobucken responded. The Jayhawk’s rescue swimmer helped both boaters get from the yacht to the Janie B, a good Samaritan vessel. The two boaters were transferred to the Coast Guard boat and then to shore. The fire was out when Ponzer Volunteer Fire and Rescue and the Bath the Fire Department arrived. They shut off the fuel to the engine room. 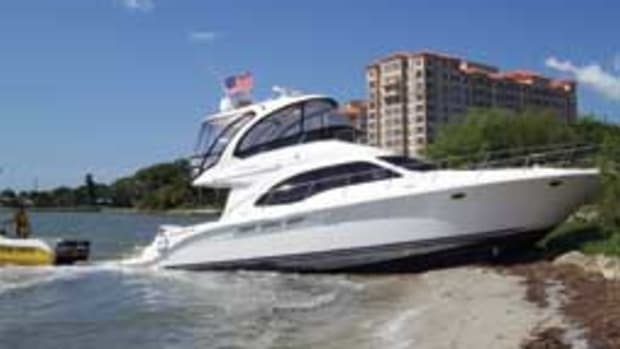 The owner of the yacht had the boat towed to shore. On Sept. 7, 1846, the 160-foot sidewheel steamship S.S. New York sank in a hurricane while shuttling passengers and $40,000 in gold and silver coins from Galveston, Texas, to New Orleans. 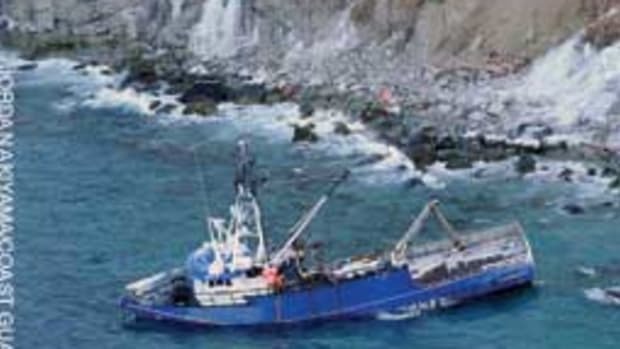 Thirty-six of the 53 passengers held on to debris for two days before they were rescued. The wreck was discovered in 1990 and divers have recovered more than 400 gold coins and 2,000 silver coins valued at more than $1 million. This article originally appeared in the November 2011 isuse.